ON the stormy coast of Cornwall there stand, at the summit of the cliffs, the ruins of the castle of Tintagel; a place so ancient that it is said originally to have been built by Prince Arthur, the famous king of the Britons. The rocks beneath run out into the sea in the most fantastic shapes, and the waves, which break against them in sheets of foam, produce a very beautiful effect. Few of the walls and towers of this castle now remain; and they are so old and so weather-beaten that, in colour and in form, they differ very little from the rocks themselves. in the cliffs are two deep caverns; one of these the sea has completely penetrated through, and so much have the cliffs fallen by the continual rush of the waters, that it is only by crossing a narrow slip of land, or isthmus, that the summit, where the ruins now principally stand, can be reached, and that not without difficulty and danger. making the descent, he passes what is always a cheerful object both to hear and to see in a landscape--a water-mill turned by a stream which rushes down by the side of the ravine from the heights above, and further on falls over some rocks into the sea. This is a very pretty scene; but in former days it was, much finer, when the castle stood in a perfect state, with all its lofty towers and walls. Then men clad in armour kept watch and ward upon the battlements, to see that no enemy, either by land or by water, might approach unsuspected the dwelling of old Sir Rowland, the Baron of Tintagel. He was famous for his hospitality, and for his courage in battle, and, for his love of mirth and minstrelsy, was commonly called Sir Rowland, the merry and brave. One night the wind blew in loud gusts round the walls and towers of Tintagel, and the sea roared; and the sky was so dark that not the smallest star could be seen, and the rain came down in torrents, and it was altogether so stormy and dismal that the Baron would not have turned out a dog in such weather. Whilst he sat in his castle hall, with only two of his followers, over a fire that burnt dull and heavily, either from the quantity of rain falling down the large old chimney, or the dampness of the logs of wood piled upon the hearth, the Baron seemed in a very angry mood. Something had that day happened to vex him; and those who sat with him were afraid of him, and were so silent and grave that they neither amused their master, nor themselves. So cross was the Baron, that, when one of his favourite dogs came crouching to him, bending his head and wagging his tail, in the hope to attract his notice, he gave the poor animal a kick, and sent him, with a howl, towards the hall door. But, no sooner was he got there, than the dog stopped, perked up his ears, listened, and gave a short bark two or three times. Immediately after, the blast of a horn was distinctly heard, notwithstanding the bluster of the wind and the roaring of the sea. The Baron commanded one of his men to go and enquire who it might be that thus sounded for admission at his gates at such an hour and in such a night. In those days there were no knockers to doors, and a horn, suspended without the castle gates, being blown by whoever wanted to come in, gave notice to the porter or warder of the castle. The Baron was speedily informed that there stood without a couple of miserable men begging shelter for the night, saying they were half dead from cold and hunger, and did not know where to go, for so great was the darkness they feared to pass on their way before morning. On being asked, what they were like, the warder replied, that, as well as he could see by the light of the torch, as he looked at them for a moment, they seemed to be very coarsely dressed, and had on old wrapping-cloaks; and he thought they spoke like men who were born over seas, in a tone and manner which shewed them (so, at least, he fancied) to be more French or Spanish than English. His opinion was, that they were a couple of those wandering fools, who often come from foreign parts, and go about begging at the castle and the convent doors; and, in return for their entertainment, shew their tricks, and dance and sing, and tell tales, and make merry, for the amusement of the knights and friars. "If they are such, right welcome shall they be," said the Baron, "for we lack something to make us merry; for no two owls brought from an old church tower for my companions, could have been more moping, dull, or dreary, than Gregory and Digory have been to night. They came to pass the hours away with me in this gloomy time; but they can neither sing nor say to lighten the weary moments. Go, ask these new-corners who and what they are? And if merry men and jongleurs from Normandy and Bretagne, right welcome; and if they can dance, tumble, and sing, we will have a joyful night of it, let the storm rage as it may. These fools be better than you or the owls," continued the Baron, laughing at his two solemn companions in no very courteous way. Gregory and Digory bowed in assent to their master's compliment, and were quite as glad as himself at the prospect of a little sport in that gloomy old hall. The warder soon returned, but with a long face and a very different report. The strangers were neither foreigners nor fools, nor jongleurs, but two very poor men, father and son, who had set out on an affair of business, to carry some wax-tapers much wanted at the little chapel which stood near Nathan's Kieve, and being overtaken by the darkness and the storm, they feared to go on, and so had ventured to beg at the castle-gate a shelter for the night. The Baron, on hearing this, was mightily disappointed; he was before in a very angry mood, and this new vexation made him furious; and the warder, who was as much disappointed as his master, immediately obeyed his commands to turn them away from his doors as a couple of idle vagabonds; so that, with many ill words, and some kicks and cuffs to boot, the two poor men were sent about their business. They were sadly cast down; so hard did the wind blow, that they could scarcely keep their footing as they once more retraced their steps down the long, steep, and narrow path that led from the castle to the road. They were disappointed, hungry, cold, and weary; and the bundles of wax-tapers which they bore on their backs were heavy, and required care for fear of breaking by a fall. As they were going along, they eased their hearts by grumbling, and denouncing, in no very gentle terms, the Baron of Tintagel. "And to turn us poor folk that be so hungry from his doors," said his son, who was a sturdy youth, of a bold and fearless temper. "I be starving for want of a supper. I would seek it and have it, though I called old Joan to help me to it, if I knew where she now dwelt. I'd seek her through fire and water, if any one of they pixy bodies, which folk say she has at her beck and call, would but show the way." That's as bold and as dangerous a word, Will Penruffin, as ever I heard," said the old man; "take heed of what thou sayest." But scarcely had sturdy Will uttered those words, when they both saw a pale glimmering light, somewhat in the shape of a ball, of an emerald hue, not unlike the light which the glow-worm gives from her little lamp on a fine summer's night. It seemed to roll on before them. "That's very strange," said the old man, "I do not half like it." "But I like it well," said Will, "and I'll follow and see what comes on 't; for, may be, 't is a Pixy light, and that never burns for nothing. I'll after it." "Do not, my son," said the old man; "it may lead you into harm, into a bog, to the mouth of a mine, or to an open grave in a churchyard. Do not follow it." "But I will though," said his son: "and I'll see the worst or the best on 't, or my name is not Will Penruffin." To make up your loss." These strange words seemed as if spoken by no one near; the wind appeared to carry them as the blast swept over the wanderers' heads. "Crabby Cross to make up our loss!--that's to make up our loss of a supper and a bed. What, ho! you young gentleman, that talks as if in the clouds, what do you mean by all this?" "That I will," said Penruffin, "I'll see what comes of all this, let what will betide." And away strode sturdy Will with rapid strides down the steep path, his father following and not half liking the adventure, yet afraid to trust his son (who was none of the most obedient) to his own wilful ways. The mysterious ball of fire, if so it could be called, led them on very strangely. Sometimes it rose above their heads high in the air, and shone upon them like the light of the brightest star, then it sunk down upon the ground, and shewed distinctly every pebble or wild flower that was in the path, or by its side. Now it made a dart forward; and then it glided on, making rings as if dancing on its way. Once or twice it turned into an unbeaten track, and at length fixed itself above the door of a very mean cottage with a thatched roof, that stood by the side of a path on a lone and dreary common. Sturdy Will at once understood that this was to be the end of his journey for the night; and he rapped on the door with the walking-staff which he held in his hand. The light instantly disappeared, and all was in profound darkness. "Who comes there," said a voice, in answer to Will's rap. "Night wanderers in quest of shelter and a bed," said the old man. "Pass on then,", said the voice within, "this is no place to find a lodging." "But we want something more. than that," exclaimed Will, "we be hungry; we want--"
"Something more than that! what mean you?" continued the unseen speaker. "Who led you here?" To make up our loss,"
said Will boldly, "that's all I know about the matter." Immediately there sounded from within peals of laughter; but laughter so strange it was more like the cackling of hens, when one of them exulting in having laid an egg, sets the whole poultry yard in commotion. The door opened, though no one seemed to turn the key, or to drop bar or bolt; but open it flew and in walked Will, as bold as a lion, unheeding his father, who kept pulling him back by the cloak, for he did not half like going in, but as Will would go on, his father followed after him. On entering, they found themselves in a small low room, surrounded by walls of stone; a wood fire burning on the hearth, and a lamp dimly on the table, which served more to show the gloom and discomfort of the place than any other purpose. A little old woman, who seemingly had just quitted her seat in the chimney nook, stood ready to receive the strangers. She was very ungainly to look upon. Her dress was of the coarsest brown serge, and patched with rags of many colours. Her neck bare, dark, thin and shrivelled, resembled that of a tortoise. Her eyes were black and fierce, the lids red, sore and inflamed; whilst her mouth was strangely twisted, not so much by disease, as by a cross sour temper. Such was old Joan of the wry mouth. There were many curious things, both living and dead, in that small low room. A very large black cat with green eyes was seated in the chair usually occupied by its mistress. A couple of owls were at roost on a piece of wood conveniently placed for them in a little corner recess. A toad was lying at his ease upon the hearth, as a number of unusually large black beetles ran about it, and seemed to enjoy the warmth of the embers. Many herbs were hanging up in dried bundles to the rafters of the ceiling; and a raven chained by one leg, was perched on the back of the same chair, where the black cat, with her tail curled round her, and her fore legs erect, sat purring with vast content and satisfaction, nor seemed at all tempted to move from her station by several mice which crept in and out of their holes directly under the owls' roost; and they also appeared disposed to do the little animals no harm. Joan of the wry mouth proceeded to question the new-corners in a very short manner; and sturdy Penruffin, as bold as sturdy, at once satisfied her curiosity, by telling her what had that night befallen him and his father. How they had sought shelter at the castle of the old baron, Sir Rowland, called the merry and brave, and had been turned away from his door; Will's desire expressed aloud to seek a supper and a bed, if he knew how to reach the dwelling of the good old dame (for so he was civil enough to call old Joan), in whose presence he now stood, the appearance of the mysterious light, and lastly his father's great need of a supper and a bed as well as his own. Old Joan heard him very attentively to an end, and then saying, would he do three things which she required, all his wants should be supplied, and his father's also; she bade him answer at once, Yes or No. Will's father, who had no liking either for the place or for old Joan, or for her blind bargain, would have inter posed; but the young Penruffin, before his sire could speak, stretched out his great rough hand and his brawny arm from under his cloak, seized the bony hand of the witch, and causing her withered arm to ache to the very elbow with the vehemence of his shake, said, in a loud voice, as he stamped his foot on the ground, "Three things! three times three things will I do at thy bidding, mother, so that thou wilt but keep thy word." Old Joan keeps her word to woman or man." The bargain was thus sealed; and no sooner was it done, than such a strange combination of noises filled the little room as never the like was heard before. The owls hooted; the cat set up a caterwauling, the mice squeaked, the toad croaked, the snake hissed, and half a dozen of black hens made their appearance from some unobserved nook; these last surrounded Will, and made such a cackling as nothing could be compared to it for discordant sounds. "My family bid you welcome," said old Joan; "and now for your promise, you must fulfil that given to me; and if you go well through it, and never flinch, then a supper and a bed shall be yours, such as the churl of Tintagel, when he makes merry in hall, would never have given to you or yours. Now for the proof of your mettle, if you be a man." Here 'Will's father would again have interposed; but old Joan very unceremoniously swept her broom across his mouth, so that when he endeavoured to speak, his son could not understand a word he said. She then bade him sit down and be quiet in a chair near the fire; and gave him the assurance that, if he did not play the fool and meddle with her and his Son, he should presently have a good supper; but, if he disturbed her again, she vowed she would turn him out, as the bluff Baron had done, to wander in the dark and in the midst of the storm. He obeyed, though reluctantly, for indeed he could not help himself; and seeing into what a house his son's imprudence had brought him, he thought it best to be quiet, for fear of enraging so wicked and so powerful a witch as old Joan, She now proceeded to her work. Bite his thumb and draw his blood." Immediately a strange-looking little creature popped through a hole in the door. The creature was not more than seven or eight inches high, with wings like a gnat, and a curly poll, which looked more like the down of a bird than hair, with a very queer and comical face; black, sharp eyes, like those of a mouse; being quite naked, and having a little, short tail behind, that he whisked and twisted about at pleasure. "That's my pretty Pixy," said old Joan. "What hast thou there?" With herbs that work my mistress' will." Another little Pixy appeared of a far more strange appearance than his brother. He had the face of an ill-disposed child; round but roguish. His small legs and thighs were covered all over with hair; his tail, though short, was more bushy than that of little Lynx, and he had the wings of a bat, both on his shoulders and at his heels. No sooner had he appeared than he alighted at once on the broomstick of the witch; catching hold of it by his tiny fat fingers, and whirled himself round, and round, and round it, in his Pixy fun, so that it dazzled Will's eyes only to see it. Old Joan, who did not enjoy this sport so much as the Pixy, shook him off, and sent him tumbling upon the ground. He would have got a severe, fall, had not a dozen or two other Pixies, till that moment unseen, rushed forward and bore him up among them as their leader and master. Joan ordered him to leave off his antics and to do her bidding. Whereupon Crabby Cross made a spring and seated himself at once upon her shoulder, and received in a whisper her commands. He gave three tumbles, head over heals, in token of obedience; and immediately after popped through the key-hole, followed by his train of attendant Pixies. In less than a minute, there came a great bounce against the door, and in the Pixies rolled a large bee-hive, which had been taken from the cottage garden. 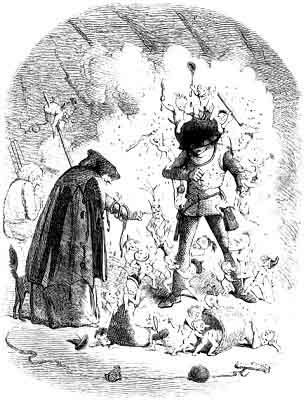 Crabby Cross, assisted by his fellows, seized upon an old kettle that stood in the chimney nook, whilst little Lynx and two or three dozen more snatched up old Joan's ladle, and though thus heavily burthened, assisted by a whole army of Pixies, they absolutely stuck the old kettle on the top of Will Penruffin's head; and there began to batter upon it with might and main; and the bees began to swarm upon Will's face and head in such a manner that notwithstanding all his courage he gave himself up for a dead man. But convinced she was obeyed, and that Will would really die before he spoke, the hag bade Crabby Cross desist; and at her bidding, kettle, ladle, bees and hive were as speedily moved off as they had been moved on. And now came the last trial of sturdy Will. Over the land, over the sea. Beat him, pinch him, black and blue." "We'll beat him, pinch him, black and blue," was the chorus echoed from a thousand little throats, to this command of old Joan; and in came such a troop of hens and chickens as never before was seen. The leader of these was a fat black hen, which, like the snake, had no sooner entered within the charmed circle than it rose into a monstrous bird. Myriads of little wretches, some with heads like those of old men, others with baby faces; some with wings of birds, others with those of bats, or flies, or gnats; and a thousand other winged creatures, all gathered round Will, and fairly pushed him on the hen's back; so that he was obliged to sit across it for safety; as, most marvellous of all, she dashed through the cottage window, which little Lynx opened to make way for her; and though she and Will were two such large beings, they passed through it with all the ease imaginable, never even touching its sides. Where they went to, Will's old father did not know, for he neither saw their flight nor their return, so frightened was he. And Will himself afterwards declared that he really could not very well remember where he had been; though he was not without a suspicion he had, in that brief flight, ascended above the storm and the clouds which hung over Tintagel, and had a peep at the man in the moon; who was, as he described him, an old gentleman with a long white beard, and everything about him seemed made of silver. He supposed, but could not take upon him to say it with certainty, that a moon-beam had been caught in this way, as when the black hen brought him down again and whisked him once more in safety through the window; he (Will) unquestionably had a moon-beam in his cap, which old Joan took carefully off, as he thought, with the intention to put it into pickle. At all events, she was so well pleased with his courage and his having kept his word to obey her in three things, that she desired him to apply the charmed herbs, brought by Pixy little Lynx, to his bitten thumb, which immediately healed. He likewise, at her bidding, washed his face with the dew, also given with the herbs by the Pixy, so that not a sting from a bee remained to give him pain. And as to the fern-seed, he cast down that to the great black hen which brought him back again; and she fell to picking it up and eating it so heartily, that whilst she was thus engaged he slipped off her back without damage; and then artfully scattering a few seeds beyond the circle he led her out of it; and she returned to her natural size and shape, and cackled off in quest of her chickens. And now came Will's reward. Old Joan was not worse than her word, as he had kept his. She gave him and his father a fine fat goose for supper; delicately cooked by the Pixies, with apple sauce. And to this was added a pie made of young rooks, a favourite dish in Devonshire; and as nice a junket formed of rennet and cream, as ever came from the hand of the daintiest dairy maid of the 'West of England. Old Penruffin was so well regaled that he forgot all his nervous frights and fears, and drank Joan's health with hearty good will, in as nice a mug of mead, the product of her bees of the former year, as ever was tasted. The supper ended, she gave them both as comfortable a bed, on a large heap of clean straw, as man could desire to rest upon. And as Will Penruffin's nerves were a little shaken by his midnight journey on the hen's back, and he could not immediately fall asleep, according to custom, as soon as he laid his head on the pillow, old Joan resolved to soothe and to compose him to rest with melody. At her command, the bellows began blowing a soft and gentle air, as the kitchen door creaked to a perfect tune, the cuckoo clock set to playing, and the wind came humming through the window with the most plaintive and drowsy sounds. Will was so lulled and charmed that he soon out-snored the music. Morning came; a clear, bright, beautiful morning; and welcome it was after so stormy a night. No sooner did the first beams of the sun tip the clouds with red and gold, and make the blue sky look even more lovely than it naturally did by force of contrast, than Will; who was still fast asleep, felt his nose tweaked in a very queer way; whilst his mouth (which he had been sleeping with wide open) was tickled inside as if by a hair; and his ears pulled for him in right good earnest. Get up, Penruffin, and have your fun." Will, now fairly awake, obeyed the summons; he shook off the Pixy company, who took it in good part, and flying through the keyhole, they went to announce to old Joan that her guest was risen and ready for breakfast. Whereupon that ancient dame regaled him and his father with a bowl of milk fresh from the cow, and some hot cakes baked on the hearth, no doubt by the Pixies. Their meal ended, both father and son were about to depart, but as they would not be ungrateful for their good cheer, they proceeded to offer their thanks to old Joan in their rough Cornish fashion. And with gold thus rewards a bold and brave man." 1 That the soul of Prince Arthur resides in the body of a chough; is the popular belief of many of the peasantry on the coast of Cornwall.